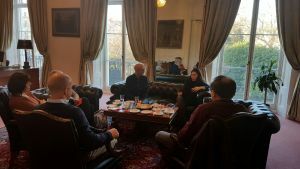 On Saturday, 9 December 2017, a meeting was held between Chargé d’Affaires a.i. 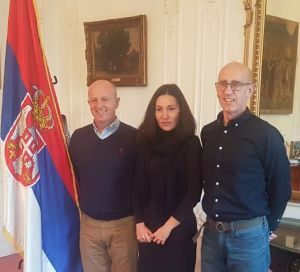 Nataša Marić and President of the humanitarian organization Blazing to Serbia Steve Logan and his associates. The President of Blazing to Serbia has delivered very positive impressions of a recent visit to Serbia and presented plans for future cooperation. Nataša Marić thanked for the ten-year cooperation of this humanitarian organization with Serbia, as well as for the generous donations so far. Both sides expressed satisfaction with the current level of cooperation.